Sometimes, an alt-code that I find on the internet does not work on my PC, for example Pi alt code (Alt+227) throws Ń isntead of π. So I need to use the character in clipboard (or in a file or wherever) and conver it to Alt-code compatible with my system. Is this possible? The Alt code are system-dependent: they depend on the local of the system. In some situations, it also depends on the application software. An Alt number code works consistently only when number is less than 127. 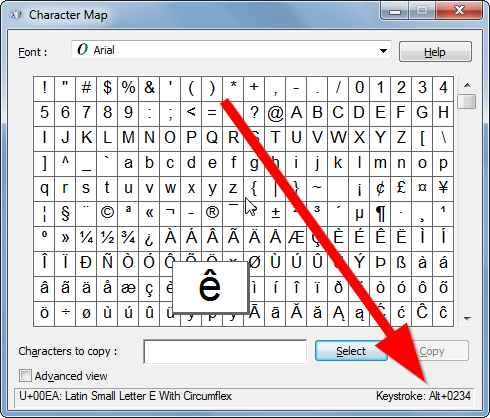 General info: How to enter Unicode characters in Microsoft Windows. You can start "Character map", choose your font, search you character and at the bottom (in the status bar) is the Alt code you need. The fact that you get a different character with Alt + 227 is probably that you're using a different font. So choosing the right font in "Character map" is important. BTW nowadays the Alt combinations consists of a 4 digit number to accommodate a wider range of Unicode characters. The three numbers still work but the Alt + 227 is different from Alt + 0227. Alt codes only work up to 255. There's a slight trick: adding a lead 0 will give you consistent results. Alt-0227 consistently is ã. But since Alt codes only work up to 0255, it's clear that the thousands of characters needed for Chinese, Korean, Russian, Greek, etc. can't all be supported. The only greek character I found was Alt-0181 µ (mu). Not the answer you're looking for? Browse other questions tagged windows-7 unicode character-encoding or ask your own question. How can I find the Alt KeyCode for a glyph with the Windows system tools? How to get the Unicode code and symbol name for some characters in a PDF file? Conversion from Unicode fails. How can I find the offending character? How to insert any Unicode character using the Unicode HEX Code on Windows (Word/Notepad/Web Broser URL or input field/other apps)?